A curry paste made up of a combination of ingredients, which typically include small green chiles, lemongrass, skin of the kaffir lime, shallot, garlic, shrimp paste, salt, galangal, pepper and coriander. Ingredients will vary between recipes. 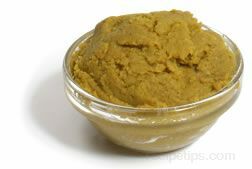 Thai green curry paste is used to season curry soups and stir-fry dishes. It can be found, prepared and packaged, in ethnic markets.